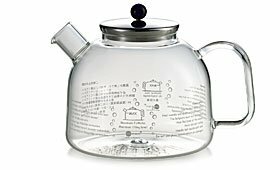 The Glass Water Kettle, by Adagio Teas, is a neat take on the traditional tea kettle. Its glass construction allows you to watch water boil! This brings to mind the old saying “a watched pot never boils” and I tend to agree. Waiting for water to boil can seem like forever, but this way you’ll be able actually watch the boiling take place. This kettle works with all types of heat (gas stoves, electric cookers, ceramic hobs) and is also dishwasher safe. Available from Adagio Teas for $29.